The Spruce Island condos for sale are tucked back against the Blue River at a point where the river widens and turns into several forks. While the six town-home style condos in Spruce Island are not actually on an island, the river is their backyard, and a footbridge from it leads to several small isles in the river and to the opposite bank where the base of Peak 9 of the Breckenridge ski resort is located. 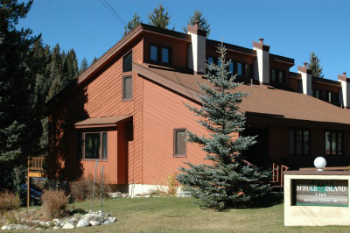 The free town shuttle stops a block away from any condo for sale in Spruce Island, making getting around Breckenridge a breeze. Discover available Spruce Island condominium listings found below, or find out more about the surrounding neighborhood. Spruce Island was built in 1979 by six families who had been skiing at Breckenridge for years. They come with plenty of room for families with a large loft and a spacious deck overlooking the river. The ground floor has more living area and a patio that allows easy access to the river. The small complex has a well-maintained wood exterior and plenty of off street parking. Maintained trails make it easy to ski to the base of Peak 9 and walking paths lead from Spruce Island to the center of downtown or into the national forest. The open space of the Four Seasons Village along the river is the northern neighbor to Spruce Island and gives access to a longer stretch of the river for fishing, which is a privilege reserved for homeowners and residents. Size: 1864 to 1889 sq. ft. Amenities: on the Blue River, close to town, close to the base of Peak 9, near shuttle stop, large units. Located at 1386 Broken Lance in Warriors Mark, across the Blue River from the base of Peak 9, just south of the Columbine neighborhood. Contact us to discuss your real estate opportunities in the Warriors Mark neighborhood, or any other Breckenridge area.